It is a common trope in popular science fiction that the best thing one can do for humanity if one owns a time machine is to travel back to the early 20th century and kill Hitler. If I had a time machine, however, (and the hubris to think I could single-handedly change history for the better) I would not kill Hitler. I would instead kill Jean-Jacques Rousseau. 1. Totalitarian government as replacement for the family. 3. Private property and civilization itself as an alienation from nature. 4. The superiority of sudden (violent) revolution over gradual progress. Without these ideas? No French Revolution, no Karl Marx, no Lenin, no Stalin, no Mussolini, no Hitler, no Mao, no Pol Pot, no Castro, no Trotsky and therefore no American Neoconservative movement. No welfare state, but the private charities the State displaced. No Leftist revolutionary movements and therefore no reactionary Right-wing movements. No State-worshiping hyper-nationalism and therefore no world wars. No hypocritical "watermelon" environmental movement: just market incentives to preserve resources and natural diversity. If there were no Jean-Jacques Rousseau, perhaps there would have been another to codify and popularize these ideas. Or maybe we would have had centuries of relatively peaceful and boring human progress through technology and slow trial-and-error rather than centuries of exciting but horrifying bloodshed and violent revolution. Apollonian: Pallas quintile North Node; Pallas co-ruler Jupiter quincunx Sun and indirectly connected to Mercury; Pallas co-ruler Neptune sextile Sun and indirectly connected to Mercury. Dionysian: Pallas and Pallas co-ruler Jupiter quincunx Pluto; Pallas co-ruler Neptune trine Pluto and square Jupiter. The Dionysian side is quite a bit stronger than the Apollonian side here, putting Rousseau somewhere between "Criminal" and "Statist" on "the Axis of Good and Evil". The chart suggests a fundamentally unethical person, albeit one with enough logical faculties to make him potentially much more dangerous than a completely Dionysian personality. This is a typical strong-authoritarian chart. Capitalist: Venus/ruler quincunx North Node. This signature is unclear to me. Mixed signatures like this often end up on the "capitalist" side of the line, but perhaps the Venus/Node connection would need to be a hair stronger to nudge it there in my opinion. Conservative: North Node quincunx Venus (ruler of Moon) too weak to count? Liberal: Moon conjunct Neptune, Moon ruler Venus semisquare Neptune, Fourth House ruler Jupiter square Neptune, South Node in Cancer. We might call Rousseau a "hyper-liberal" in the cultural sense. The urge to "kill the culture" indicated here is extremely strong. Strong authoritarian + economically vague + extreme cultural liberal = the man who would remake his culture in his own image? 1. Pallas and Pallas co-ruler Jupiter quincunx Pluto; Pallas co-ruler Neptune trine Pluto and square Jupiter. "The Dark Side of the Force is strong in this one." Jupiter/Moon-Neptune/Saturn T-square: the solidification/codification (Saturn) of a philosophy (Jupiter) of social change (Moon/Neptune). The Saturn-Pallas sesquiquadrate reflects someone who has the potential ability to codify his particular form of ethics/logic, as compromised as they may be. Saturn in Leo square the Moon seems to reflect his extremely poor treatment of women (Moon) as a reflection of his own authoritarian egotism (Saturn in Leo). Jupiter in Aquarius in the Fifth House in aspect to virtually everything: Rousseau promoted himself to all as the greatest humanitarian who ever existed. 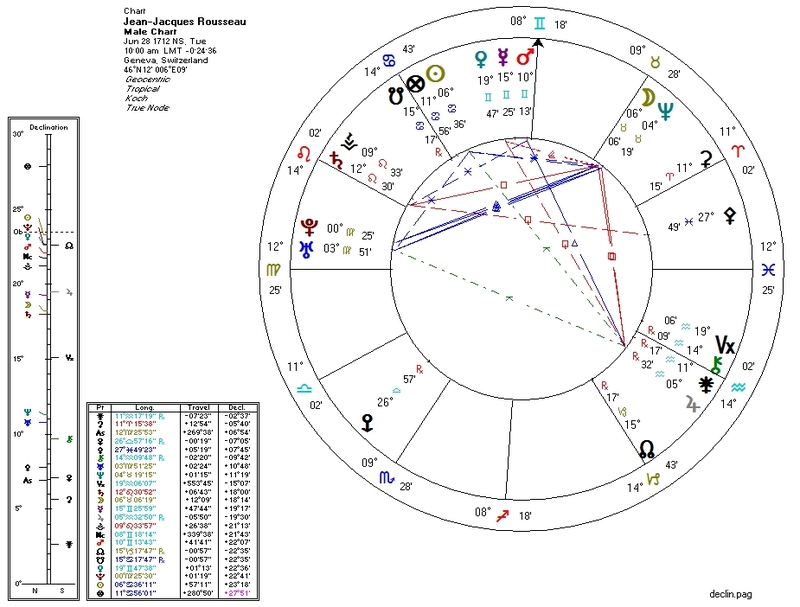 Chiron on the Sixth, and Mars in aspect to North Node, Venus, and Mercury: I've seen these connections in the chart of a person with hypospadias, from which Rousseau also suffered. I haven't researched this condition, but the astrological configuration is striking. Sun conjunct South Node; Pluto quincunx Jupiter in the Fifth: Killed. His. Own. Children. Part of Fortune conjunct South Node in Cancer: fortune through misfortune, or by leeching wealth from women? In the book "Intellectuals" by Paul Johnson, one can read about the horrible man behind the horrible ideas. Somebody invent the goddamn time machine already.